The Francophone Network of the Anglican Communion (le Réseau francophone de la Communion anglicane) connects four million Anglicans and Episcopalians around the world. The purpose of the network -- at its origins and now -- is to support Francophone Anglicans in carrying out God’s mission: to encourage them to come together to share experiences, to learn from one another, and to promote efforts to engage in collaborative work, such as leadership training for lay and ordained leaders. Since 2002, the Anglican Francophone Network has been recognized by the Anglican Consultative Council as an official network of the Anglican Communion. An 'Executive Council of the French Speaking Anglicans around the World' grew out of efforts begun in Paris in 1985 by a priest from the American Cathedral in Paris. The Rev. Canon Dr. Jacques Bossière understood the need to gather the French-speaking leaders of the Anglican Communion. Taking inspiration from the movement/association Rencontres-Internationales, he first organized the network as a 'Rencontres.' The first international conference of the Francophone network took place in Limuru, Kenya, with the logistic support of ANITEPAM (the African Network of Institutions of Theological Education Preparing Anglicans for Ministry) in 1995. The Anglican Francophone Network's most recent triennial meeting (September 2012) convened in Douala, Cameroon. Network President Bishop Pierre Whalon and his colleagues continue to work on the Network's original mission, which includes: addressing the needs which arise from the growth in the numbers of francophone Anglicans, building the church, and focusing on evangelism. The group also is serving as a catalyst for the development of French-language texts. Indeed, the Network has new energy and direction as to how to best support and initiate the development or translation of liturgical texts and much-needed Anglican catechismal resources. At the 2012 gathering, the group adopted a resolution that calls on itself to name a liturgical team to focus on this work. The action was taken, in part, in response to the decision of The Episcopal Church (headquartered in New York City) to make, as soon as possible, a fresh French translation of TEC's 1979 Book of Common Prayer, and to include in it a lectionary. Another focus for Network members at the meeting in Cameroon was the continuing conflict in the Democratic Republic of the Congo. Most Congolese Anglicans live in the eastern Swahili speaking region of the country; it is the most damaged part of Congo, a situation that is the result of two civil wars. The Network, by resolution, offered its prayerful support of the church of the Province of the Anglican Church of the Congo, as it is officially known. The next triennial meeting of the Network will convene in 2016 in Bujumbura, Burundi. 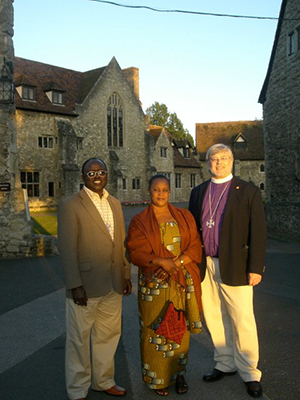 The Archbishop Henri Isingoma and Mrs. Isingoma with Network President, Bishop Pierre Whalon. Since 2009, Archbishop Isingoma has served as Primate and Archbishop of the Anglican Church of the Congo.